When William Allegrezza, publisher of Moria Books, created a politically-oriented imprint, locofo chaps, to create 100 chaps during the new Administration’s first 100 days, he surely could not have realized then the full brilliance of his idea. For its genius was based partly on whether enough poets would be moved to participate in his ambitious project. Allegrezza intended for the chaps to protest the new Administration and its policies. After receiving and publishing the chaps, Allegrezza plans to send copies to the President himself. A series of publications in protest against the new President’s policies is a fine idea by itself. Why not? Writers write. Publishers publish. And hopefully there will be readers to read. Moreover, it’s long-believed by many (not all but many) poets and critics that poetry’s role is partly to pay attention to society, and critique and educate where possible (“It is difficult / to get the news from poems,” wrote William Carlos Williams, “yet men die miserably every day / for lack / of what is found there.”). But what grabbed my attention right away about locofo chaps was its publisher’s plan to send the chaps to the White House. This intention elevates the project from being only a publishing project—an element that is timely as many publishing projects rose in protest against the new Administration. As some observers have noted, one wonders about the effectiveness of such projects—are they just artifacts to be read and treasured for their literary experience? Yet that’s a simplistic question as the type of poets who participate in such projects are probably also engaged in other ways of protests—e.g. new or renewed efforts to support organizations that work to protect those under attack by the new administration’s policies. For example, the 740-page protest anthology, RESIST MUCH OBEY LITTLE, (which I review HERE) is also a fundraiser for Planned Parenthood. Similarly, locofo chaps—by being sent to the White House—is not just a series of publications but its own protest rally. What are rallying here are not (just) people, their authors, but literature itself as presented by chapbooks of poetry. Literature’s own protest rally—that’s smart! The existence of the National Endowment of the Arts, among others, is after all being questioned. And if the new President “does not read,” then I don’t see why literature can’t be another constituent that protests at its erasure or marginalization, just like immigrants, refugees, transgenders, women, and others who have felt attacked by the administration. It is ingenious as well because of the charge or snark that’s been tossed about by the new President: He. Does. Not. Read. (Besides social media, that is.) Thus, does literature protest. Thus, do (chap)books protest. Reading expands the mind—one need not look much beyond the President’s elementary school level language to see the effect of non-reading. One can observe a similar effect in the simplistic black-and-white world view promulgated by someone incapable of shading immigration policies with compassion, or presenting with seemingly no irony a religious/Christian front without having its nuance affect refugee policies. Reading expands culture and we see how social justice gets short shrift from a leader mostly oriented towards economic policies. 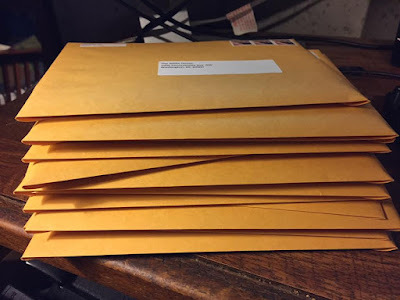 Some have said about Allegrezza’s idea of sending chapbooks to the White House that they might just end up in the trash. Which is to say, their presence (by being ignored by the recipient) would be a wasted effort. Really? I’m not convinced. I would liken the chapbooks being tossed into the circular files as like when protests and rallies in front of the White House inevitably end and people return to their homes. But their acts were witnessed and discussed and there will or can be results. Someone’s first participation in a rally at the White House, for example, might be inspiring or ennobling or encouraging enough for that someone to continue with more acts—not just protest marches but other ways—for the rest of that person’s life. Also, protest actions do matter as history shows. Their effects can be individual or as part of a collective action. The receipt of a hundred poetry chaps might be insignificant, if it is, but as part of a larger series of protest actions those chaps also contribute to an exponential effect displaying resistance. Related to this effect, certainly, is the structure of locofo chaps. Like other Moria publications, the chaps are available for purchase as print publications, but they also can be read for free from the publisher’s website—the White House tossing these chaps into the trash can will not erase their existence. The effects have been/will be generated before and after the President received his own copies. If Allegrezza hasn't already thought about the logistics of mailing the hundred chaps to the White House, I would suggest to document that moment, e.g. photos of the chaps, photos of the mailing process at his post office, et al -- those photos and related commentary could be posted on a linkable site which then could generate further discussion outside of the chaps' reception at the White House. UPDATE: he recently posted on Facebook this photo of chaps being prepared for their journey to Washington D.C.--perhaps a teaser for a larger documentation? Still, I want to return to the idea of the chaps as being merely literature. If they weren’t to be sent to the White House in protest, locofo chaps are still valid—even more valid beyond expectations now that we see the type of chaps that have resulted from Allegrezza’s idea. (As I write this, 48 of the hoped-for 100 chaps have been published.) I see at least three elements that have surfaced from the published chaps—something not under Allegrezza’s control as he could not have anticipated how poets would respond to his Call. The first element are chaps discernibly in response to particular actions during the administration’s early days. While some chaps contain (older) poems that were written outside of the new administration, many of the chaps also exist in specific response to the new President’s policies or their effects. These include Barbara Jane Reyes’ edited anthology Nevertheless, #She Persisted, which was written in response to Republicans trying to silence Senator Elizabeth Warren from criticizing Jeff Sessions, Nicholas Michael Ravnikar’s Liberal Elite Media Rag. SAD! with its self-explanatory title, Melinda Luisa de Jesus’s Petty Poetry for SCROTUS’ GIRLS… (whose first poem, by the way, is the best one-word poem I’ve read in recent memory), Donna Kuhn’s Don’t Say His Name whose titular edict this review is following, among others. The second element I observe is the wide variety of “constituents” represented in locofo such as women, minorities, immigrants, non-binary genders, among others. This result has to be welcome by a publisher prescient enough to color the locofo logo in the LGBT community’s “rainbow” colors of diversity, acceptance and inclusion. The third element is the distinct Filipino or Pilipinx presence among the voices that have found publication in locofo. The authors are not just those based in the U.S. but also in the Philippines, South Africa and Australia—to date, these authors are Kimberly Alidio, Michelle Bautista, Aileen Ibardaloza Cassinetto, Luisa A. Igloria, jose Padua, Angele Peñaredondo, Cristina Querrer, Barbara Jane Reyes, Arlene Biala, Veronica Montes, Jay Santa Cruz, Mg Roberts, Leny M. Strobel, Glynda Velasco, Jean Vengua, Romeo Alcala Cruz, Melinda Luisa de Jesus, Rose Theresa Booker, Amalia B. Bueno, Rachelle Cruz, Rachel Ronquillo Gray, Jaime Jacinto, Michelle Peñaloza, Tony Robles, Aimee Suzara, Shirley Ancheta, Irene Faye Duller, Angela Narciso Torres, Wesley St. Jo and myself. I also know of some forthcoming publications (at the time of this writing) that will present Sheila Bare, Jim Pascual Agustin, Merlie Alunan, Ivy Alvarez, Rodrido Dela Pena Jr., Jennifer Patricia A. Carino, Jhoanna Lynn B. Cruz, Jose Edmundo Reyes, Dumay Solinggay, R.A. Villanueva and J. Liha Yatco. locofo’s readers and perhaps Allegrezza himself may not realize that the history of Filipinos in the United States—including Filipino presence in English-language literature—historically is one of invisibility. These writers’ presence in locofo chaps is a rare example of not just token representation but real inclusion. As a Pilipinx, I’m grateful—one reason I sent over as much as five chapbooks to this series (the five includes collaborations and an edited chap). On behalf of “us all,” Thank you, Bill: Maraming Salamat! I cite three elements but if pressed—and perhaps after seeing the rest of the 100 chaps—other aspects can be cited to affirm the gloriousness, if you will, of Allegrezza’s idea. Indeed, I much appreciate the locofo structure of free .pdf reads for another reason: increasing the presence of poetry within the internet. This motivation, by the way, is one of the reasons Galatea Resurrects was created in the first place: the belief that just poetry’s existence in the net will help balance other types of content and in ways one can’t anticipate (a rationale somewhat addressed by my Editor’s Introduction to the inaugural issue of Galatea Resurrects). New Balance Poem: A week after 2016 Election, Boston-based New Balance VP of Communications Matt LeBretton made a pro-Trump comment in regards to the then-president-elect’s positon on the Trans-Pacific Partnership. Social media response to the company included product bans, and protestors trashing or burning their New Balance products. For more information about consumer-related Trump affiliations, visit grabyourwallet.org. Alternative Fact: Collage of phrases/ideas from Donald Trump and Meredith McIver’s “book” How to Get Rich. Ballantine Books/A Random House Publisher, 2004. “Poem for Empire: Found poem from the International Classification of Diseases Clinical Modifications (ICD-9-CM) Professional Edition for Physicians. Yea though I walk through the valley of darkness, let me not be driven by fear. Let me consider myself, and the many lives that have made me. If I am harmed, let me wash the wound. Let me tend it, with care and curiosity, so I do not fear it. Let me raise it, like a child, til it grow and leave me, or til it learn community within me. Let me know the world. Let me know myself, and let me remember the space between my molecules, between all molecules. There is much mystery here. Let me be alive and wonder. What’s powerful about the above excerpt is partly its energy. But it’s a brief excerpt. The energy pulsates throughout Bloomberg-Rissman’s longer work and it’s admirable to maintain such across its scale. Other examples are discussed in Galatea Resurrects’ separate reviews of individual chaps: Barbara Jane Reyes’ edited Nevertheless, #She Persisted, Roy Bentley’s Men, Death, Lies, Donna Kuhn’s Don’t Say His Name, Charles A. Perrone’s A CAPacious Act, Melinda Luisa de Jesus’ HUMPTYDRUMPFTY AND OTHER POEMS, Francesco Levato’s A Continuum of Force, and Joel Chace’s America’s Tin. My engagement with PUNETA: Political Pilipinx Poetry is also available at The Halo-Halo Review. I very much look forward to seeing the second half of locofo’s chaps. As with many great equations/engagements, this is a project whose sum will be greater than its mathematical total: worthwhile reading, worthwhile thinking, worthwhile action.